Tooth and Tail is a real-time strategy game, or RTS downloadable through the Steam gaming platform, where we will lead animal armies in merciless battles for land and food control. In Tooth and Tail we will have the main factors that define a STR of the usual: Build a base, collect resources and build a huge army to crush our enemies. In addition, it also has different breeds to choose from, each of them with their respective skills, units and elite units, as well as being fully customizable. Longcoats, Commonfolk, KSR and Civilized participate in this merciless war to see who eats and who is eaten. It has a very entertaining single player campaign, although it also has a multiplayer mode, and the maps are generated randomly so the game has a high gameplay because with each combat we will be forced to change our strategies depending on the terrain. 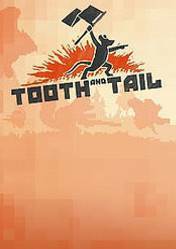 There are no comments yet about Tooth and Tail. You can be the first one! WTF is... - Tooth and Tail ?